The History Channel show “American Pickers” is planning a trip to Louisiana and they are looking for leads on places in the Bossier area where they can do some picking. 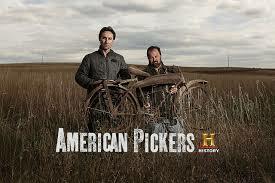 “American Pickers” is a documentary series that explores the fascinating world of antique ‘picking’ on the History Channel. This hit show follows two of the most skilled pickers in the business, Mike Wolfe and Frank Fritz, as they embark on an epic road trip across the U.S. in search of America’s most valuable antiques from motorcycles, classic cars and bicycles to one-of-a-kind vintage memorabilia. They are particularly looking for folks of interesting character with interesting items and lots of them! Please note that the pickers only pick private collections. They don’t do stores, malls, flea markets, museums, auctions, businesses or anything open to the public. If you have a large collection or want to refer someone to Mike and Frank, email your name, number, city, state and a description of the collection to americanpickers@cineflix.com . Include photos if possible. Or call and leave a message at 1-855-OLD-RUST. The show is currently not looking for: Farming/agriculture items, tools, glassware, appliances, tractors, crocks, stoves or country primitives. I have a Doughnut cooker. Makes a dozen doughnuts at a time. I also have a Singer Sewing Machine that was manufactured in 1952. The cabinet needs some work but other wise it is good condition.